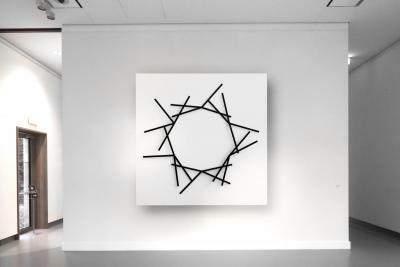 Dynamic structure 201014 consists of 24 black lines that can rotate independently from each other in front of a white background. These lines are mounted on six rotation points. On every point four axes rotate within each other. Therefore the lines can cover each other. On each of the six turning points, one, two, three or four lines can be visible. The lines can move steplessly clock- or counterclockwise or be at stop.